IR - How did you get involved in the tattoo industry? IR - When we were hanging out, you mentioned that you began drawing at an early age. Having a father that tattooed, how did that influence you when you were learning to draw? Michael - Yeah man at an early age I kind of found a passion for drawing, I think just like any other kid, I just loved doodling, my father wasn't around a whole lot being deployed in the armed service, but my mom said I always kind of entertained my self and drawing was that outlet that kept me busy, but I guess to more answer the question I never really thought about how it affected me because I never thought I'd be tattooing for a living, but I guess I'd say I definitely found a interest in it being around it in my younger years. IR - That's awesome man. For someone that hasn't seen your work yet, how would you describe your style? IR - I'd say that's a good description. Where do you find your inspiration for your art? Michael - Cartoons, movies and anime, I love the use of vibrant colors and some of the color pallets cartoonist are using now a days, and looking at other artist work like, Timmy b, will Gonzalez, Taylor Cory and Marshall Sinclair are some dudes I look up too. IR - I can definitely see those influences in your work. What's your favorite anime? IR - I know that Kitty at 617 is a big anime fan too. What's the best thing about your shop? You guys seem to have a good time. IR - Ha! I saw that! I'm looking forward to meeting him.. Seems like a terrific shop. Do you do work in any other mediums? IR - That's killer man! I've enjoyed seeing your illustrations lately. What is one of the most challenging things about being a tattoo artist? IR - What has been your most meaningful accomplishment so far in tattooing? IR - That's awesome man! To be able to be passionate about something like that, it's what it's all about man. What are your next goals that you want to accomplish? IR - That's a great perspective on things to have man! We wish you nothing but the best! I appreciate you taking the time to talk with us. Where can people find you and your work online? Ink Revolution is a tattoo lifestyle magazine. 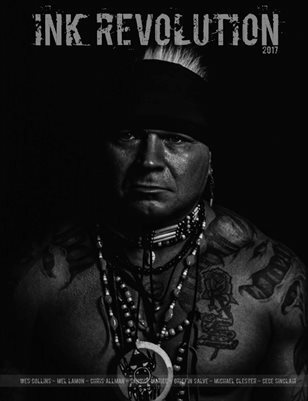 In the Spring 2017 issue we talk to Wes Collins about his Cherokee ancestry, and about tattooing in Native culture. We sat down with tattoo artists Michael Clester and Chris Allman. We talked with tattoo models Mel Lamon, Cece Sinclair, & Candice Mariee. We talked herbs with Griffin Salve, food with chef Eric Fulkerson, and a highlight on Marty Hambone Hamilton.